"And I will shew wonders in the heavens and in the earth, blood, and fire and pillars of smoke." It was near "Eagle Rock" that the Lord once again revealed Himself to His servant and prophet, Brother William Branham in January 1963. Brother Branham had gone to this place to pray, seeking guidance, leadership and understanding concerning the present stage of his ministry. A few days previous he had preached (in his church in Indiana) a Message entitled "Sirs, Is This The Sign Of The End?" In that Message he rehearsed recent Supernatural happenings in his life. He talked about Dreams and Visions; especially the vision of Seven Mighty Angels coming to him. He thought it might mean his death - his home-going. In that Message he also spoke of the 'fulfillment' of Revelation 10:1-7 and The Seven Thunders. He wasn't exactly sure HOW God would bring his Ministry to it's climax. The Angel had shown him, as early as 1955 that his ministry would be fulfilled in "Three Pulls" or Phases. The first two pulls had been manifested (one right on the heels of the other) and clearly identified; seen, filmed and witnessed by thousands of people. But, it seemed to Brother Branham that he had been waiting a long time for that Third Pull to come to pass. Still, he waited on God. He didn't try to manufacture something. After preaching "Sirs, Is this the Sign of the End? ", he had moved West in obedience to what God had revealed in Six dreams, capped off by a vision. Now within a few days after arriving in Tucson, Arizona, he finds himself in the Catalina Mountains, praying, with his hands raised heavenward - suddenly, a beautiful Sword appeared in his hand. Startled, he wondered about the significance of the Sword and what it had to do with his Ministry. In a moment we'll let Brother Branham himself tell exactly what happened. But first let's consider these couple of thoughts on what the Scriptures teach about 'a Sword'. The Apostle Paul in Ephesians 6:17 declared the "Sword of the Spirit" to be "The Word of God". In the hands of a Believer "the Sword" of the Word of God is his/her weapon of defense against the attacks of the enemy. That same Sword in the hands of God Himself brings judgment upon individuals and Nations. When entering into battle, Gideon and his 300 soldiers were instructed to cry aloud, "...The Sword of the Lord and of Gideon..." During a time of battle Joshua turned to see an Angel - the Captain of the Hosts of the Lord, standing nearby with a Sword in his hand. Again we find Balaam being stopped in the way by an Angel with a drawn Sword. 12. His eyes [were] as a flame of fire, and on his head [were] many crowns; and he had a name written, that no man knew, but he himself. 13. And he [was] clothed with a vesture dipped in blood: and his name is called The Word of God. 14. And the armies [which were] in heaven followed him upon white horses, clothed in fine linen, white and clean. 21. And the remnant were slain with the sword of him that sat upon the horse, which [sword] proceeded out of his mouth: and all the fowls were filled with their flesh. And did you notice that one Angel, was a strange Angel? He looked more to me than any of the rest of them. You remember that? They were in a constellation - three on a side and one on top. And the one right next to me here, counting from the left to the right, would've been the seventh Angel. He was brighter, meant more to me than the rest of them. You remember, I said he had his chest out like that, and was flying eastward. And I said, "It picked me up, lifted me up." Do you remember that? Here it is. The one with the Seventh Seal, the thing that I've wondered all my life. Amen. Them other Seals meant a lot to me, of course, but, oh, you don't know what this has meant. For one time in life... I prayed; I cried out to God. 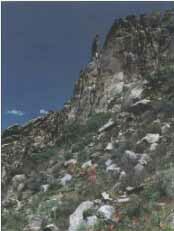 (After that Phoenix meeting - January 12-27, 1963 - any of the people there with me know;) I laid in the mountains. One morning I got up and went up in Sabino Canyon; it's a great rugged high mountains. And I'd went up in there, and there was a little foot trail after you lead off - go on up into Lemmon Mountain which is a thirty mile walk, and there about thirty foot of snow up there. So, up in the mountain real early before day, going up through this little foot trail, rolling rocks along, I felt led to turn this a-way. And I turned and went up into some great jagged rocks, oh, my, hundreds of feet high. And I knelt down between those rocks. I laid down this Bible and laid down this little tablet. I said, "Lord God, what does this vision (of seven angels) mean? Lord, does it mean my dying?" (You remember I told you I thought it might mean my death, because something exploded till it just shook me to pieces). And then in the room (when he received the vision - Editor)), I said, "Lord, what does it mean? Does it mean I'm going to die? If it is, all right; I won't tell my family. Just let me go on (See? ), if my work's finished." But He sent a witness back (You remember me telling you?) that it wasn't that, it was a furtherment of my work. And setting up in Sabino Canyon... The heavenly Father knows this, just as true as you see that come to pass, those Angels come right down and a-vindicated every message to be the same. Then you know whether it comes from God or not. It was foretold you by a vision. I couldn't tell you until the service was over, because I was forbidden to. In Sabino Canyon, sitting up there that morning, I had my hands up, and the wind had blown my old black hat down. When I was standing there with my hands up, praying. I said, "Lord God, what does this mean? I can't understand it, Lord. What am I to do? If it's my going home time, let me go up here where they'll never find me. I don't want nobody to be mourning around if I'm going. I want just the family to think that I just took a walk, and they won't find me. Hide me away somewhere. Maybe Joseph will find my Bible laying here someday, and let him use It. See? If I'm going away, let me go, Lord." And I had my hands out, and all at once something hit my hand. I don't know. I can't say. Did I go to sleep? I don't know. Did I go into a trance? I don't know. Was it a vision? I can't tell you. Only thing I can say is - Just the same thing like them Angels was. And it struck my hand, and I looked, and it was a sword, and it had pearl handles, real pretty; and had a guard over it with gold, and the blade looked like, something like a chrome, like silver, only it was real shiny. And it was so feather-edge sharp. And I thought, "Isn't that the prettiest thing?" just fit my hand. But I said, "Hey, I'm always afraid of them things" - a sword. And I thought, "What will I do with that?" And just then a voice shook down through there that rocked the rocks, said, "It's the Sword of the King." And then I come out of it. "The Sword of the King..." Now, if it said, "a Sword of a King..." but it said, "The Sword of the King," and there's only one "the King," and that's God. and He has one Sword; that's His Word, what I live by. And so help me, God, standing over His holy desk here with this Holy Word laying here, It's the Word. Amen. Oh, what a day we're living in, what a great thing. See the mystery and secret? Standing there, when this left me, something just come to me and said, "Don't fear." Now, I didn't hear no voice, like on the inside of me spoke. I just tell you the truth, just exactly what happened. Something hit and said, "Don't fear. This IS that third pull." Third pull, you remember it? He said, "You've had so many impersonators on this, what you tried to explain." But said, "Don't even try this." Do you remember it? Why, it's all over the tape and everywhere. That's been about seven years ago. Said, "Don't try to explain that." Said, "This is the third pull, but I'll meet you in there." The Angel told Brother Branham that the "Sword in his hand" represented the Third Pull of his ministry and it would be the WORD. Brother Branham continues his narration as he recounts the vision he received in 1955 - about seven years previous. I had this line and that, what I had in my hand, was a little baby's shoe, about that long. And that string was about as big around as my finger, about a half inch, like. And the eyelet in this shoe was just about the size of a - less than one-sixteenth of an inch of the eyelet. And I was trying to lace this little shoe up with this great big inch cord. And a voice come, said, "You can't teach Pentecostal babies supernatural things." Said, "Now, let them alone." And just then He picked me up. And He took me up and set me way up high to where a meeting was going on, looked like a tent or a cathedral of some sort. And I looked, and there was a little box-like, little place over in the side. And I seen that Light was talking to somebody above me, that Light that you see there on the picture. It whirled away from me, like that, and went over to that tent, and said, "I'll meet you there." And said, "This will be the third pull, and you won't tell it to nobody." And in Sabino Canyon, He said, "This IS the third pull." And there's three great things that goes with it, and one unfolded today, or yesterday, the other one unfolded today, and there's one thing that I cannot interpret, because it's in an unknown language. But I was standing right there and looked right straight at it, and this is the third pull coming up. Oh, my. That's the reason all heaven was silent. Now, I'd better stop right here. I just feel checked not to say no more about it. So just remember, the Seventh Seal, the reason it was not opened (See? ), the reason It did not reveal it, no one should know about it. And I want you to know before I even knew any word about that, that vision come years ago. You remember that? And here it is just as this other has - slides right straight into the Word exactly where it was. You notice. Notice now, for the end of time message this Seal, after all, He's revealed all the six Seals, but it don't say nothing about the Seventh. And the end time Seal, when it starts, will be absolutely a total secret according to the Bible. And remember, Revelations 10:1, 7 (chapter 10:1-7) at the end of the seventh angel's message, all the mysteries of God would be known. We're at the end time, the opening of the Seventh Seal. Don't try to make yourself odd to be a Christian, because (You see? ), you take yourself away from God... If you can understand it, this is that third pull. You should've caught that the other day. See. So then just... You remember, there'll be no impersonation like there was of the other two. See? So that's as far as you should know. Now just remember that you see now there's something taking place in this room, and there's something here. There's actual in this room, Angels, voice of God (See? ), but if you can't hear the natural voice without something to send it out, how are you going to hear the spiritual voice? The Angel was right - "There'll be no impersonation of this." When the Prophet came with Signs and Wonders, many sought to impersonate that kind of a ministry and still yet today some Evangelist try to impersonate that Ministry which God manifested in William Branham. But, alas, they all fall so miserably short of the perfection of the Signs and Wonders in that ministry. One thing is certain - they will never attempt to impersonate "the Teaching" that followed those "signs and wonders". They can't accept the Revealed Word. They refuse to acknowledge that the Sword (WORD) of the Lord for this Age was placed in the hand of William Branham. The Above quotes were taken from the Message "The Seventh Seal", which is part of a larger series Published by Voice of God Recordings, under the title, "The Revelation Of The Seven Seals". A copy of this book is available from The Voice of God Recordings at a cost of $2.00 (U.S.) or FREE of charge by contacting us at the civic or e-mail address below.